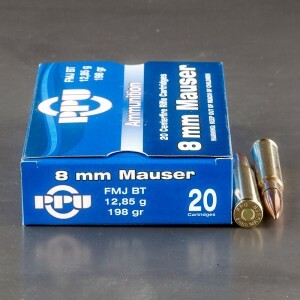 Full metal jacket 8mm Mauser ammo (aka 8 x 57mm JS) is a centerfire, rimless, bottle-necked, .323 caliber, rifle cartridge originally adopted by the German military in 1888. The cartridge itself is a popular sporting round in Europe due to the fact that its case dimensions are nearly identical to the .30-06. 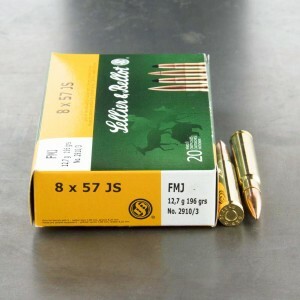 Since full metal jacket bullets are relatively simple to manufacture, ammunition loaded with this type of bullet is often significantly cheaper than that loaded with soft point spitzers and thus, FMJ ammunition is often an excellent choice for target shooting or shooters that like to get their trigger time in bulk. 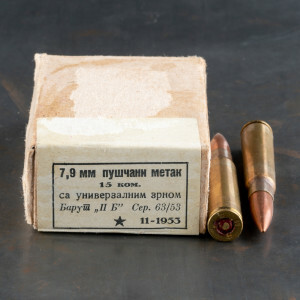 It should be noted that while all modern factory loads incorporate boxer primers, European military surplus loads usually incorporate corrosive Berdan primers and thus, rifles should be thoroughly cleaned after firing this type of ammunition.